Grotesquely realistic! All latex chest with attached straps. Add your own shirt and pull open to reveal rib cage and exposed bloody endtrails. 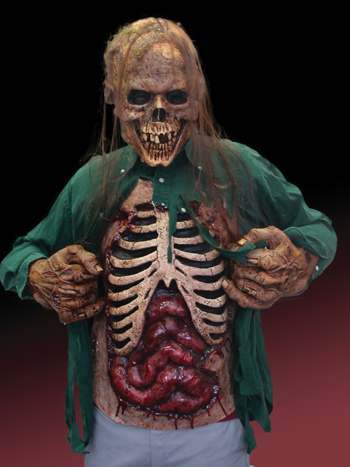 Goes perfectly with our Flesh Eater Halloween mask as shown in photo, or many other zombie and skeleton masks. Chest attaches around the neck and lower torso with thick black straps. A great way to make the most complete Halloween costume possible! Mask and hands shown are not included.